Kids Love to Pray Too! Not only children, but adults need a 'hiding place,' a place of safety. I work with victims of child abuse and neglect, spousal battering, bullying and even of attempted murder on a daily basis. Oh, that they would all know, at a heart level, Kathleen's wonderful and delightful truth that every child can find a hiding place in our precious and loving Father. Each of us, in our way, is a child, has an inner child, and needs that hiding place. Thank you, Kathleen, for this beautiful reminder." ~ Dr. Joseph Ozawa, Clinical Psychologist, Courts of Singapore. Children can become powerful prayer warriors! They have faith and determination and can be taught to be sensitive to the voice of the Spirit in prayer. I Love to Pray will show them how. This 40-day devotional provides kids with the tools they need to soar as intercessors. Its exciting stories, motivational suggestions and simple theology will connect children to Jesus Christ and set them up for a lifetime of experiencing His presence when they pray. Kids Love to Pray Too! 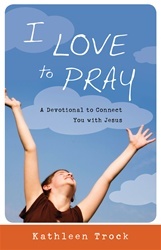 is based upon Dr. Alvin Vandergriend's devotional book and adult Bible Study Series, Love to Pray. If you would like to see the generations praying together and children falling in love with God through prayer, this curriculum is for you. Genesis through Revelations contains story after story of individuals who talked with God. God Speaks explores the different ways in which God spoke to them and their responses. God Speaks encourages the participants to continue to listen for His voice and to respond to it. The curriculum introduces "listening prayer" and journaling. This collection of "New Songs" will delight the heart of the listener. The songs are predominately the songs of children expressing their praise and worship. The youngest psalmist is three and a half years old. Select from three different CD choices.